Below are a few eulogies, remembrances, encomia, etc. for the late Barry Hannah. No introduction needed. Thank you, Barry. I experienced both sides of Barry’s honesty when I was a student of his in 2003 at the Sewanee Writers’ Conference. The day of my workshop, we moved around the table in usual fashion–what’s working, what isn’t. Janet Peery was co-teaching the session, and among the group were writers such as Ben Percy, Lisa Lerner, Dave Schuman, Dave Koch, Forrest Anderson, and John Struloeff. I was giddy to be in the room with one of my literary heroes. And while the others were offering feedback on my writing, I stole the occasional glance to see how Barry was reacting. Most of the time he spent flipping fairly idly through my pages. So perhaps I shouldn’t have been a surprise when, upon his turn to speak, he began gutting the opening paragraph of the prologue to the novel I’d been working on. Sentence by sentence, word by word, he worked like a butcher, cutting back the fat. Let’s just say that there wasn’t much meat left when he got down to the bone. Or, rather, he showed me that there hadn’t been much muscle to begin with. Would it be too much to say I felt eviscerated along with my work? Yet it wasn’t cruel. It was honest. And when the furnace of my face cooled I saw that he was mostly right. But I didn’t want my teacher and literary icon to have this impression of my work (I swear, the rest was better). So, later that night, during the evening cocktail hour, I slipped him one of my stories, one which I’d been carrying around for the better part of an hour rolled up in my fist, wrinkled and creased. And when I finally got the nerve to give it to him, I tried hard to assure him that this wasn’t extra work. Nothing I was looking for feedback on. Nothing he even had to read during the conference. Just, well, something I wanted him to have. And I’m sure I must have said something inane like, “I hope you enjoy it.” As if it were some sort of gift. Walking away, I was certain that I had made things worse. And the next morning, when Barry found me at breakfast, I was more than sure of my mistake. “Here, kid,” he said, handing the story back to me across the table. Without another word, he walked off. Cut to blistered cheeks again. In front of an entire table of your peers, Barry Hannah has just returned the story you gave him the evening before, the story meant to redeem you. “Thanks, but no thanks,” is what you read in this gesture. And in that moment you imagine escaping back to Michigan several days from now–it’s a nice, long trip from Tennessee, one that will give you plenty of highway to replay this moment over and over and over. Yet when I unrolled my story, he’d scrawled this across the top in loopy script: “Great story. Thanks for giving me this. I’m nominating it for Best New American Voices.” Simple. Generous. An unasked for kindness. And I realized that it wasn’t about you in that classroom; for Barry it was about the work. syllabus.”I’m your Captain for the next six weeks.” He thought if we didn’t get better at writing, it was his fault. He wanted us to be better writers, but I think more he wanted us to be better humans, to laugh more, to try for joy. He used that word at lot. I think it was his favorite word. Joy. But he told us how hard joy was to get and keep. That you had to fight for joy and defend it from the haters of our world. He talked about his friendships with other writers, Brautigan, Carver, Lish. He was hard as hell on us too, but somehow gentle at the same time. He would destroy you in workshop and then buy you a beer and act like you were his oldest friend. It wasn’t personal. And when he gave you praise you knew you’d earned it. If he liked your story he would say things like, “this is a work of genius and deserves wild applause.” And when he was harsh he gave it to you straight. Never going into much detail. I remember getting a story back my first year and all it said was, “Oh, please. I don’t believe this. Lacks authority.” He liked that word, too. Authority. We worked hard because we didn’t want to let our Captain down. He rode his motorcycle around town with a dew rag on his head, always grinning. He beat back cancer twice and smoked till the day he died. He loved his students and considered us friends and treated us like peers. He wanted to start an MFA band at some point called the Mother Fuckers Association, M.F.A. but we never got around to it. He loved music and considered it the highest art. He believed in teaching writing, that it could help you if you listened and worked as hard as you could. But he hated the idea of “school.” When class started he would shut the door and say, “Ok, that’s school out there. This is life in here.” He got me out of my literary theory requirement by telling the chair of the department (a Princeton educated Marxist critic) that there was no such thing as literary theory. For the first two years I knew him I couldn’t talk I was so scared of him. I was terrified of his books they were so good. When I read them I thought this is some weird genius guy who works and works on every sentence, sharpening them. But after I got to know him I realized that his prose, his sentences, were not worked over at all. It wasn’t technique. That was just the way he talked. He talked the way his prose sounded and his prose sounded the way he talked. He was always living each sentence he said. Diamonds flew out every time he opened his mouth. He had been sick ever since I knew him and in the past few months it got worse. Last Friday he came into the bookstore and I was working. He had his oxygen tank on and finished his cigarette before walked in. We had just been talking about him, wondering how he was doing and then bam there he was, walking through the door. He joked with us about stuff in the news, bought some books. After a while I had to go on my dinner break and I said, “Bye, Barry.” And he said, “Bye, Michael. Bye, my buddy.” He looked better than he had in a long time and was happy. In his last few days he was surrounded by students. He gave us absolutely everything he had. The following is his syllabus from fall of 2007. The original was typed on a typewriter. Hannah fall 07. office hours:1-3:30, Wed, 205 Bondurant. This semester let’s concentrate on entertainment as apposed to mere “character study,” and stories of no passion but still-life “insights.” Why does lack of action, red-blooded emotion, plague graduate school fiction? This old flag has waved too long. What happened to pirates, storms, fiends, horror, temptresses with cleavage, lies, theft, greed, lust, random acts of meaningless (or meaningFUL) violence? Have the news media captured all the good stuff? I’d love to see us recapture the passions of old. This instructor has groaned too long over the riskless, “subtle” flat “studies” unneeded and rejected, for the main part, by even the reading public. We’ll have 4 stories about a month apart. Stories due finals day. No final as such exists. Deadlines are dead final. One absence is allowed. Two mean failure. I will be your Captain for the next six weeks. Happy sailing. The better you get, the more fun – for me, for you. I was among the dwarves over in Alabama at the school, where almost everybody dies early. There is a poison in Tuscaloosa that draws souls towards the low middle. Hardly anybody has honest work. Queers full of backbiting and rumors set the tone. Nobody has ever missed a meal. Everybody has about exactly enough courage to jaywalk or cheat a wife or friend with a quote from Nietzsche on his lips. These are the opening sentences to a story called “Ride, Fly, Penetrate, Loiter.” It is hard to talk about writing like Hannah’s. He is the kind of mad-cap genius you are almost afraid to read when you are a young writer, or, hell, an old one, because he smashes every rule and bit of sense and builds it back up from scratch into something raw and gleaming. You can’t help but let him sink into you. I’m doing it already. What do I love about this passage? Look how beautifully the tone and town are set, yet without any concrete details or the expected plot set-up. Hannah’s sentences always careen to their own logic, their clauses leap out of the bushes at you. They are like the folk sayings transmitted from some other world. And that last sentence is one of my favorite in fiction. A writer needs to swallow some Hannah sentences on a regular basis. He is good for the soul. One comes to Barry Hannah in the same way one drives a car through a building and keeps going. The metaphor stops there. Barry Hannah is nothing if not a master of presentation. His work does not represent or narrate the event. His work presents the event itself, immediately: the moment of insurrection, a Civil War of its own. 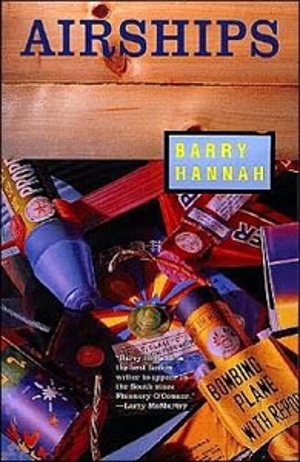 “Ray, I didn’t think it would ever get to this”: this is the moment of fissure, of quake, and the rhetoric of madness which defines Hannah’s “I”–the water liar who teases us with the truth like waving a gun playfully only to, finally, fire it. How to mourn Barry Hannah? Surely we re-read, or read for the first time. But there is another life to mourning: we do not forget. Though I have never met Hannah, his voice, his southern intimacy, has been etched into me. That warmth and gentleness which will slip subtly away and forget itself in moments of high despair, of an “I” lost to itself–that passion, that fecund joy which seats each sentence, that laughter simultaneous with the very worst hurt: it might be trite, but when we read Hannah, we give him life, even, or especially in his absence. It is very worst hurt which, in Hannah, laughs: love, loss, and Luckies. It is the impossible joy of mourning, of giving life to the dead. The Captain is finally flying.